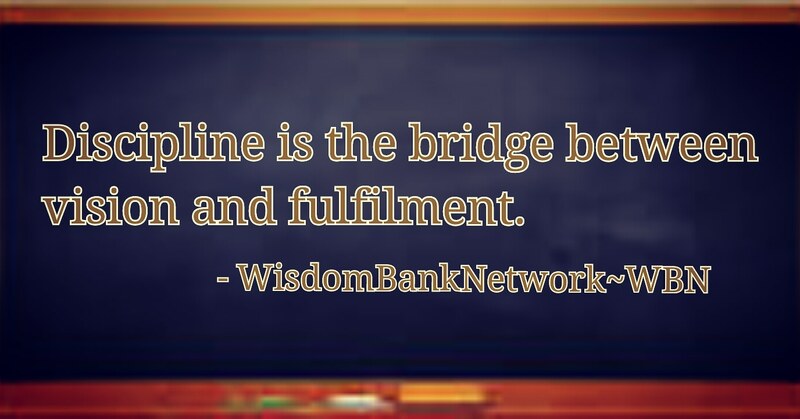 DISCIPLINE IS THE BRIDGE BETWEEN VISION AND FULFILMENT. Discipline is doing what is required whether convenient or inconvenient. It is the bridge between vision and fulfilment. No vision can be fulfilled without discipline, no matter how great the vision. Sometimes, we feel like resting or having fun when we should be doing something about our vision, if we are not discipline, we will give in to what we feel like doing instead of what we should be actually doing. It takes discipline to receive vision from GOD, because an indiscipline person cannot stay in the presence of GOD. This implies that lack of discipline is the reason why so many people are yet to discover the vision(plan) of GOD for their lives. It takes discipline to keep doing same thing without losing enthusiasm. It takes discipline to do what GOD wants us to rather than doing what we want to do. SO MANY SUPPOSED-TO-BE GREAT DESTINIES ARE OUT THERE STRUGGLING WITH LIFE DUE TO LACK OF DISCIPLINE. THEREFORE, LET’S ENSURE WE EMBRACE DISCIPLINE FOR US TO FULFIL THE VISION OF GOD FOR OUR LIVES…BE WISE…!!! FOCUS GIVES MEANING TO VISION. 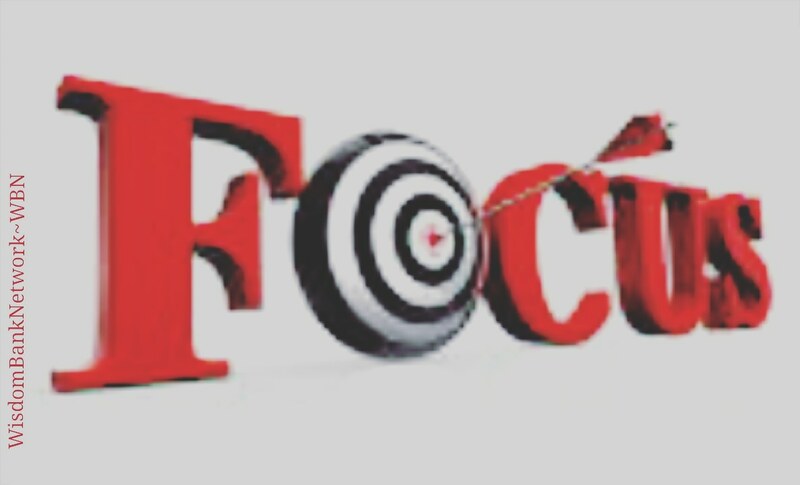 The first revelation I received of the anchor scripture is “focus”. If you focus on a single purpose, your whole life will be full of light and shine around the world. When you focus on your vision, it will make the world focus on you. It is only people of one thing that makes marks on earth, people that are involved in so many things hardly succeed in any of those things. It is popularly said that jack of all trades are master of none. When you discover the vision of GOD for your life and you get divine direction, focus on it, don’t deviate from it, don’t try to do so many things. GOD did not create you to do so many things, GOD created everyone of us with a single purpose. We are the ones that have created so many other activities for ourselves that gets us too busy and makes us lose focus of vision(plan) of GOD for our lives, because of temporary benefits. IT IS PEOPLE THAT FOCUS ON THEIR VISION THAT EVENTUALLY BECOME CELEBRITIES. THE HEROES WE CELEBRATE TODAY ARE KNOWN AND CELEBRATED FOR ONE THING, NOT MANY THINGS. YOU ARE NOT WIRED TO DO MANY THINGS. THEREFORE, STAY WITHIN YOUR VISION…BE WISE…!!! Many are actually working hard, but they have nothing to show for their hard work. Many are actually running with their vision, but they have no result. This is obviously not due to laziness, but due to lack of direction. When a divine vision lacks divine direction, it will be full of sweat and struggles, but when divine vision is coupled with divine direction, it makes a person a show to the world. It is wise to wait in the presence of GOD to get vision, but it is wiser to also stay in the presence of GOD to get direction. One of the reason for sweats and struggles in the bid to fulfill vision is because as soon as people get vision, the launch out in haste without waiting to get direction. GOD is the one that revealed the vision to you, so HE is the one that should direct you on how to fulfill the vision, don’t run the vision the way you like. DIVINE DIRECTION IS WHAT ELIMINATES SWEATS AND STRUGGLES IN LIFE. IT IS NOT THAT YOUR VISION IS NOT REAL, IT IS JUST THAT YOU ARE YET TO SEEK DIVINE DIRECTION. 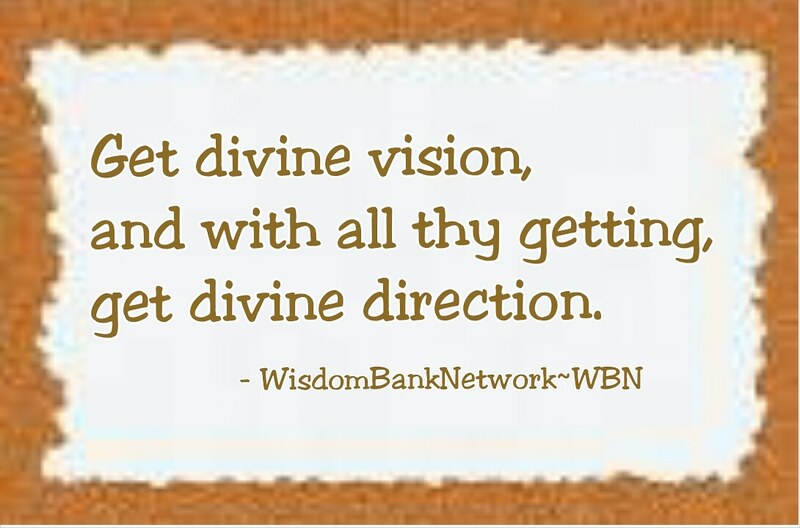 THEREFORE, GET DIVINE VISION AND WITH ALL THY GETTING, GET DIVINE DIRECTION…BE WISE…!!! VISION IS DIFFERENT FROM AMBITION. 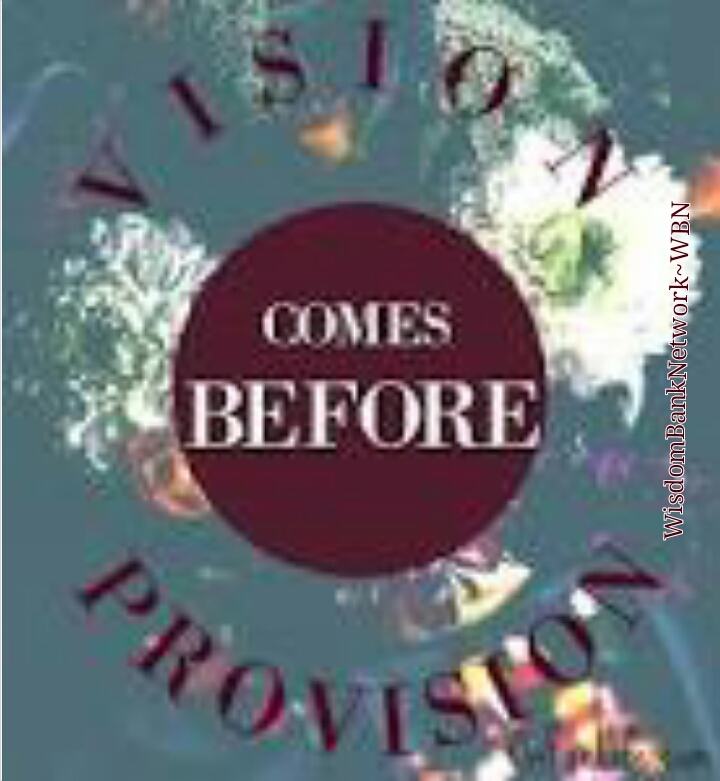 Vision is the revelation of the plan of GOD as relates to a person, groups of persons, business, ministry, nation etc. Ambition is a drive to do things better than the person that is currently doing it. Vision is from GOD, but ambition is not from GOD, rather, its springs up from envy and desire for self-recognition. Most people are running with ambition thinking they are running with vision. Adolph Hitler is an example of a person that is driven by ambition. He had the ambition of ruling the world, but he failed. When a person begins to think he can do things better than others or better than the way it is being done, such a person should be careful, because that is ambition stirring up, not vision. What if you are not created to do that thing. What you should be concerned about is how to do what you are created to do excellently, not how to outshine someone else. So, ensure you are not being driven by ambition, ensure what you are doing now is not borne out of envy or self-recognition, ensure you are driven by vision. AMBITION DRIVES YOU TO DO WHATEVER IT TAKES(WHETHER SINFUL OR RIGHTEOUS) TO ACHIEVE THE GOAL, BUT VISION DRIVES YOU TOWARDS THE PROVISION GOD HAD MADE AVAILABLE FOR YOU TO ACCOMPLISH THE GOAL. 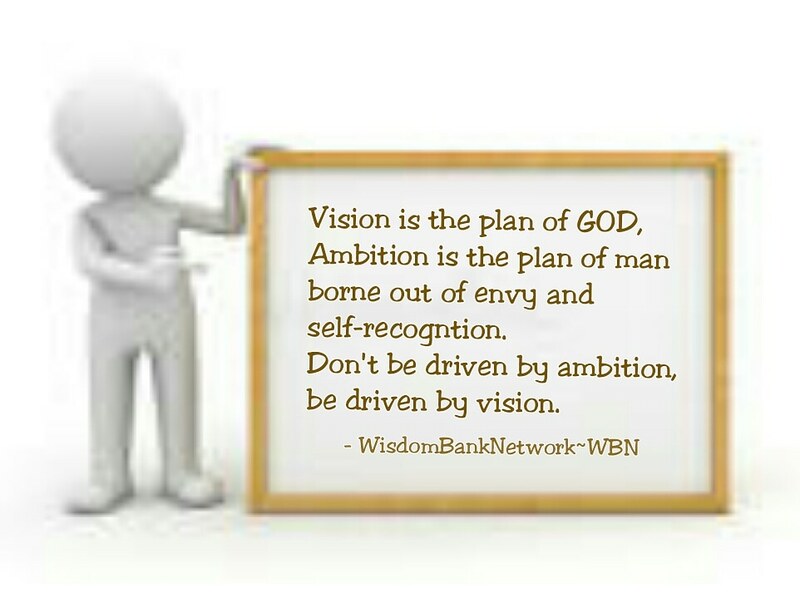 THEREFORE, DON’T BE DRIVEN AMBITION, BE DRIVEN BY VISION…BE WISE…!!! Purpose is the reason for creation. There is a reason why GOD created everyone of us, there is a reason why HE created me, there is a reason why HE created you. HE didn’t create you to add to the number of people on earth, rather, HE created you to carry out an assignment on earth(Jeremiah1:5), that assignment is called purpose, the discovery of that purpose is vision. So, vision is simply the discovery of purpose. Without vision, there can be no purpose. No one can give himself(or herself) purpose, every purpose is received from GOD, and it is received through vision. The reason why there are so many failures in the world is because so many people have created purpose for themselves. We are designed to fit in to the purpose for which we are created. For example; A person designed to be a legal practitioner can never fit it if he(or she) chooses to be an engineer and vice versa. THERE IS NO WAY ANYONE CAN EXPERIENCE TRUE FULFILMENT IN LIFE WITHOUT PURPOSE, AND THERE IS NO WAY TO DISCOVER PURPOSE EXCEPT THROUGH VISION. THAT MAKES VISION THE FOUNDATION FOR FULFILMENT IN LIFE. 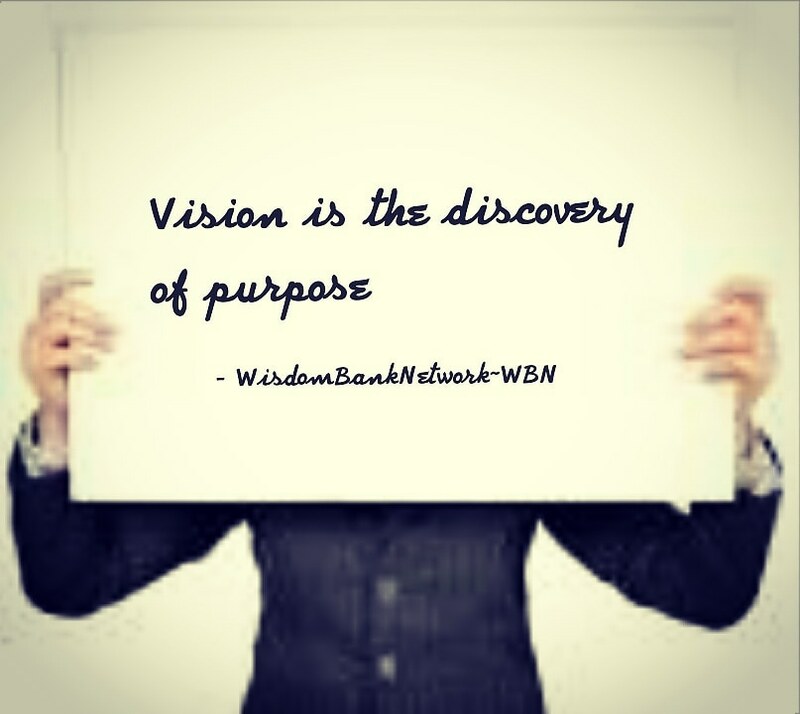 THEREFORE, IF YOU WANT TO LIVE FULFILLED LIFE, DISCOVER PURPOSE THROUGH VISION…BE WISE…!!! 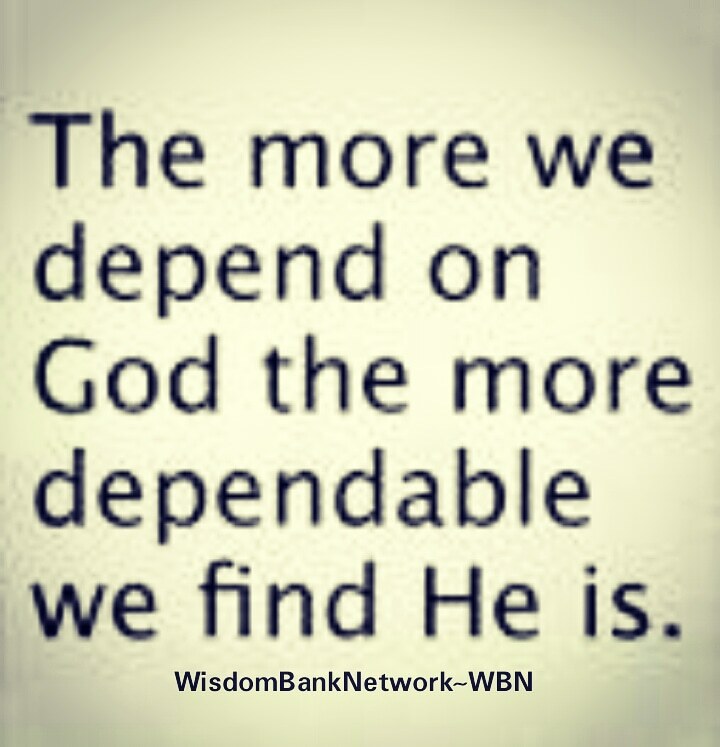 VISION REQUIRES ABSOLUTE DEPENDENCY ON GOD. It takes the power of GOD to fulfil the vision(plan) of GOD for your life. GOD will never give you a vision that you can fulfill without needing HIM. If your vision is within your ability, then I doubt if it is from GOD, because only the hand of GOD can fulfil the plan of GOD(1Kings8:15), and your vision is supposed to be within the plan of GOD, otherwise, it is not the vision from GOD. The reason why it gets so difficult for people to fulfil the plan of GOD(to fulfil vision) is because they are running the vision by themselves, and it is beyond what they can fulfill by themselves, so they get frustrated, doubt the vision and give up on it. When it comes to fulfilling vision, stop depending on your intelligence, rather always ask GOD questions on how HE wants it done. BEWARE OF EVERY VISION THAT DOES NOT NEED THE HELP OF GOD, IT IS NOT A VISION FROM GOD, IT IS PLAN OF satan TO FRUSTRATE YOUR LIFE, BECAUSE EVERY GENUINE VISION FROM GOD REQUIRES ABSOLUTE DEPENDENCY ON GOD TO FULFIL IT…BE WISE…!!! No responsible father will give his child a task to do without giving the child the necessary tools required to accomplish the task. In same vein, GOD will not give you a task without giving you the necessary tools required to accomplish the task, GOD will not give you a vision without making provision for the vision. This implies that lack of vision is one of the reason why people suffer lack of provision. The provision you need is already in your vision. Everybody on earth has potentials in or around them, which cannot be discovered until vision is discovered. For example; Moses had been with his rod for many years without knowing that the rod is the tool with which he will use to fulfill vision. He didn’t discover the use of the rod till he discover vision. Same wat, you will not discover the provision GOD have given you until you discover vision. THEREFORE, INSTEAD OF PRAYING FOR PROVISION, PRAY FOR VISION, AND YOU WILL DISCOVER THE PROVISIONS YOU NEED IN LIFE HAVE BEEN WITH YOU ALL THESE WHILE…BE WISE…!! !